The way of painting of Thomas Grochowiak is characterized by serenity and composure and gracefulness, without lapsing into perfunctoriness. It achieved its maturity through its freedom from any day-oriented pretentiousness. Its dimension originates from knowledge and joy of adventure, from unembarrassed experiencing which has not been affected from outside. At a very early stage, the different parts making up the painting break away from heaviness into the openness of space – into space and into the harmony vibrating in it, and it is not without good reason that the picture itself frequently is the answer to the sound of music. Synaesthetic ability of experiencing – a term which is used so very often – never before has been expressed in such a credible manner and never before has been transferred into painting the same extent as in the music-related way of painting of Thomas Grochowiak. 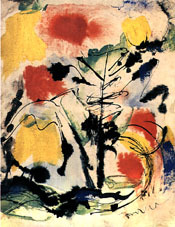 Space and its spheric harmony – they were involved in the paintings created in analogy with Darius Milhaud’s «Creation du Monde» and Joseph Haydn’s «Schöpfung» as early as at the beginning of the fifties: these are elements which somehow represent set pieces exhibiting a different richness of colour and structure, and which in their relatedness to one another start to float on their way, as it seems, to become the stage on which they act prior to any kind of entanglement. An untamed hand resulting from a harmoniously tightened ductus of the paintbrush and of highly liquid paint, which transferred melodic strains into painting – just like a letter which is written with love and contains a preciously encoded message. Oriental painting in its most liberal form and being the expression of deep feelings may be considered to have refined the means of painting, while Grochowiak’s way of painting cherishes a flourishing richness of colour. The melodiousness of Grochowiak’s paintings can be compared to the music composed by Vivaldi, by Gluck and Debussy. They are sensitive and dense, dramatic and impetuous at the same time. But despite this, they do not involve any uncontrolled outburst, but rather a spontaneity which is based on concentration and silent readiness, with the moment of performance being the moment of maturity and vice versa. The paintings clearly involve counterpoints such as freedom and order, turbulence and silence – calligraphy and the zones opposed to it, both floating and heavy structures. And frequently enough, it happens that the weighty elements start to rise and fade to easiness, and that the elements knotted to the dense parts of the painting rather moor below them. This explains why Grochowiak feels particularly close to Mozart: gracefulness and vivacity, floating and melodiousness and dance-like rhythm. However, the paintings do not only slightly resemble the music of Mozart. They exhibit its serenity as well as its ponderosity. The dark is present in the trickling of light also. They somehow involve a basso continuo which seems to make the actual melody sparkle even easier.